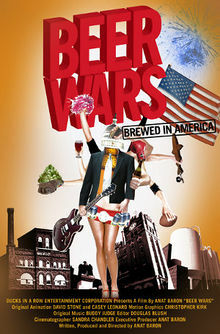 Perhaps you've seen Anat Baron's terrific documentary, Beer Wars, which does a nice job exploring big beer's efforts to undermine craft beer. Perhaps you get it. Or maybe you to live in an alternative fantasy world, where big beer isn't a threat to craft brewers. I first thought today's post would explore the Beer Institute's recent announcement that members will implement a voluntary statement of serving facts on their products. Then came today's news that the Colorado Brewers Guild has changed its bylaws, stripping big beer breweries of voting privileges. Daily double. Both developments are shots across the bows of opposing sides in the evolving struggle for the hearts, minds and wallets of American beer consumers. That battle didn't start with Anheuser-Busch's acquisition of craft breweries and it won't end with this week's skirmishes. Not by a longshot. On its face, the Beer Institute's decision on voluntary product labeling might seem like a good-hearted, well-meaning move. I mean, a lot of beer drinkers probably do want to know how many calories and carbs are in what they're guzzling or sipping. And making ABV readily available on labels can't be a bad thing. Before you jump to the conclusion that members of the Beer Institute are good guys wearing white hats, you may want to look a little deeper. You may want to ask, for instance, "Who belongs to the Beer Institute?' Alternatively, "What are these folks up to?" Hey, nice start. It turns out the Beer Institute is dominated by big beer. While there are certainly craft brewers on the member list, the organization is run mainly for the benefit of its largest and most affluent members. Those would be Anheuser-Busch, MillerCoors, Constellation Brands, etc. What are they up to? It's simple. They want to put craft brewers in a bind. Keep in mind that we're talking about product labeling. Don't confuse that with the FDA mandate that restaurants and bars post nutrition, ABV and related info on the beers they serve. Those rules will come into play in 2017. Labeling is different. Big beer knows craft brewers typically offer a barrage of seasonals and specialty beers. It would like to put a crimp on that. It knows the cost of collecting the requisite data and putting it on product labels would be substantial and prohibitive. It also knows craft brands are typically higher in calories and alcohol than the low level swill sold by most BI members. Clearly, the thrust of this move is to make craft brewers look bad or limit what they sell. I leave it to you to decide who wears the white hats and black hats in this skirmish. The train wreck in Colorado has been in motion since Anheuser-Busch acquired Breckenridge Brewery in late 2015. A lot of independent brewers took exception to Breckenridge continuing to play a role in Guild. In fact, 14 brewers (including the four largest) defected and eventually started Craft Beer Colorado, an alternative trade group. This week's vote is an effort to hold the original Colorado Brewers Guild together. In effect, the membership voted to change the bylaws such that large breweries have no voting rights or power on committers or the board of directors. The big guys can continue to be members, but they will have no input in decisions. The Guild hopes this will lead to a reconciliation with the breweries that left, and maybe it will. But it seems the breweries that bolted did so because they wanted a stronger legislative presence and more responsive leadership, in general. So we shall see how it works out. In fact, I've wondered if the situation in Colorado might have fallout in Oregon. I'm aware of one effort to form an alternative guild here, primarily because some feel the Oregon Brewers Guild doesn't serve their interests. Messages sent to the Oregon Brewers Guild asking for comment went unanswered, which wasn't really surprising. Oh well. Anyway, the beer wars are ramping up and will likely continue to do so. There will be no truce in this war. Big beer is tired of losing market share and will resort to any available means to slow down craft brewers. That includes legislation, buyouts and whatever else they think of.